At first, I didn’t quite no what I was seeing as I looked up from what I was doing. On the TV I saw a small child being advertised for sale on what looked like a shopping channel. By the time I had found the remote and turned on the sound, the logo for World Vision Canada appeared and what I was seeing began to make some sense. What doesn’t make sense is the daunting statistic that every year over 1.2 million children around the world are sold into slavery. 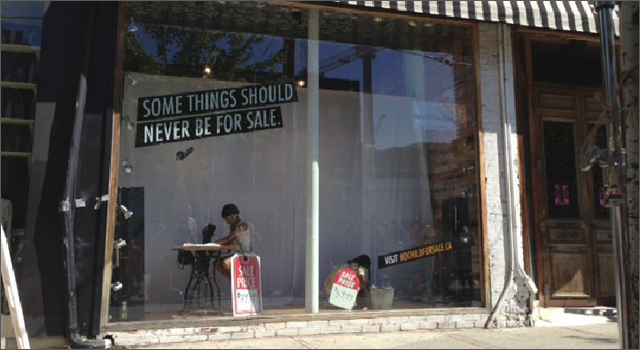 Find out more about child slavery and how you can help at nochildforsale.ca. The campaign came to life with a stunt executed at Pam Chorley’s Fashion Crimes in Toronto and at Vancouver’s Crocodile Baby. Word of a secret sale brought people and press to the sidewalk in front of both stores, where paper covering the windows was removed to reveal a shocking display of child actors portraying child labourers sewing and breaking bricks. The media and creative come from KBS+P Canada Toronto-based Real Interactive. Just as I get home tonight, I turn on the news to a report that a 9-year-old girl is missing n Lake Simcoe. The sad fact is that there has been 57 drowning deaths in Ontario so far in 2012, and I hope this incident doesn’t add to that total. I am not what you would call a powerful swimmer, but my parents required me to take swimming lessons as a kid. As part of that I have always understood the risks and limitations and my ability to stay safe in the water. The Lifesaving Society of BC and Yukon marked the beginning of National Drowning Prevention Week by hiring artist David Billings create a moving sand sculpture on Kitsilano Beach in Vancouver. The highly detailed sand sculpture shows the sad scene of a grief-stricken mother cradling the body of her drowned daughter. 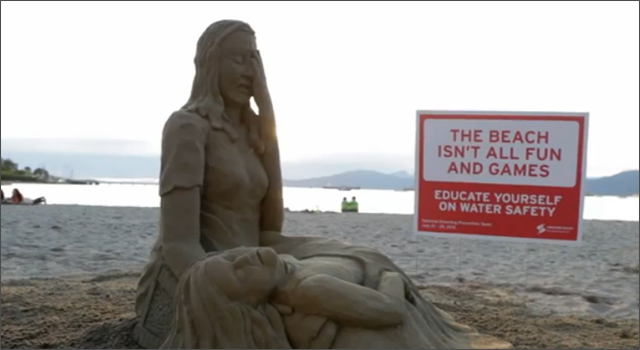 Beside the sculpture was a sign with the message “The Beach Isn’t all Fun and Games – Educate Yourself on Water Safety”. The promotion was created by Taxi, Vancouver and the video was shot by Dan Barham. Oh dear, the new hockey season is in it’s infancy and then along comes this new campaign from Eccotique Spas and Salons. The campaign is guaranteed to create new debate and controversy in Vancouver. The spa is offering ‘$50 Calm Down & De-Stress’ Gift Certificates to suspects who confess to their involvement in the riots that occurred after the final game of the 2010 Stanley Cup playoffs. On that night thousands of people rioted in the streets around downtown Vancouver causing millions of dollars worth of damages. Police arrested over 100 people that night, and debate was raised over the way that the web and social media was used to identify alleged rioters through photos, status updates and comments. 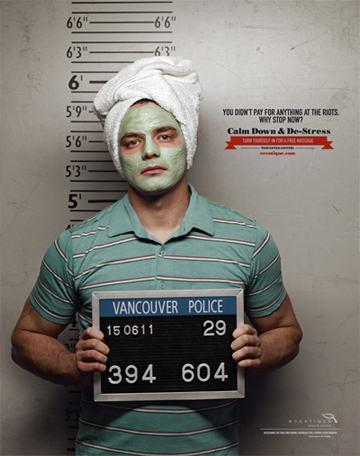 Suspects looking for a free massage, pedicure or even a little waxing will have to show their photo ID, describe their involvement in the riots, be fingerprinted and then turn themselves into the Vancouver Police Department. As the campaign’s headline reads “You didn’t pay for anything at the riots, why not now?”. Do you think that Eccotique is simply exploiting the controversy around the riots for publicity, or are they just trying to ‘do good’ by helping suspects to turn themselves in? I’d be surprised if we see anyone stepping forward to take advantage of the offer, but then again I was surprised that night to see people using their Facebook pages to brag about their looting and destruction. The campaign was created by Vancouver agency Kommunity. Thanks to @Lolzania for the tip. Would You Live at Vancouver Airport for 80 Days? The majority of people would do what ever they can to get in and out of airport as fast as possible, but to celebrate it’s 80th Anniversary, Vancouver Airport is looking for someone to live there for 80 days and share the stories of the airport with the world. 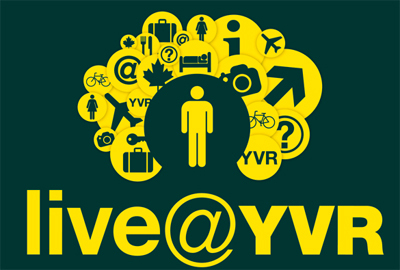 The submission round has just wrapped up with (I count) 96 video entries on the Live@YVR contest website. The Vancouver Airport Authority judges will select a group of finalists for a public voting period beginning on July 25 and ending August 5. The winner will begin their 80 day adventure on August 17 and remain there til November 4, but don’t think that the winner will be sleeping under benches in the departure lounge. They’ll have their own room at the Fairmont Vancouver Airport Hotel, and meals provided by YVR food retailers. They’ll also be allowed to spend time outdoors enjoying the walking trails around Sea Island. The airport will provide a mobile phone, data plan, video camera and editing equipment and a $15,000 honorarium at the end of the 80 days. This is a very entertaining concept to celebrate Vancouver Airport’s 80th birthday, I’m looking forward to the stories.